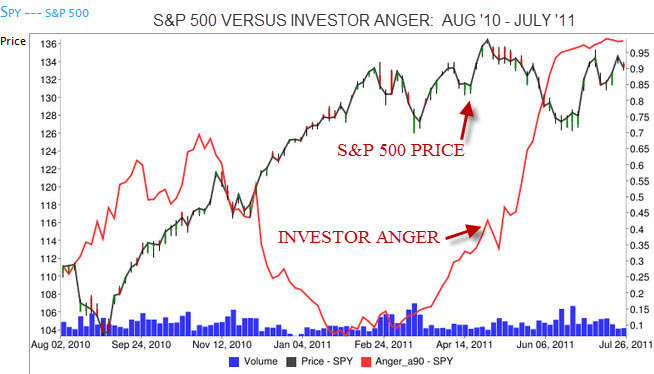 If it seems likes investors are little more angry these days, it's not just your imagination. MarketPsychData has the stats to prove it. MarketPsych's Frank Murtha caught up recently with Dow Jones and offered some commentary on the subject and some suggestions for financial advisors in dealing with it. HERE is a link to a brief video. 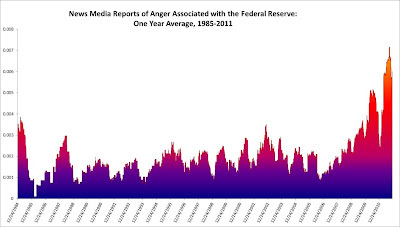 Based on our analysis of news chatter, we're seeing a disturbing (in my opinion) trend - increasing anger expressed in references to the Fed in news media. The below chart demonstrates Anger mentioned in all references to the Fed since 1985. You can see both the declining anger as the U.S. came out of the Volcker-induced recession of the early 1980s and the recent rise in anger associated with economic stagnation and political polarization. The reason this anger is significant is because high levels of anger can drive drastic and often self-defeating behavior. This is true for individuals (e.g., suicide bombers) and also for crowds (e.g., the U.S. Congress considering abolishing the political independence of the Fed). Our Bubble-ometer received coverage in Jason's Zweig's column in today's WSJ. 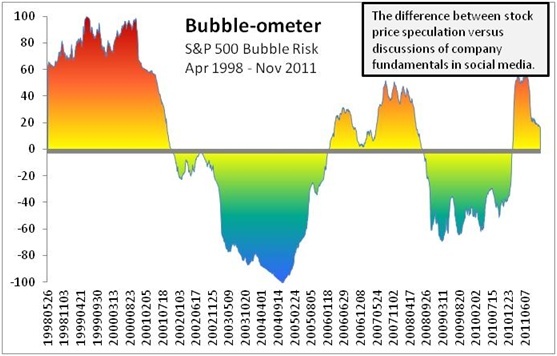 The Bubble-ometer is hosted on www.marketpsychdata.com, where we have several free tools for investors based on social media sentiment. 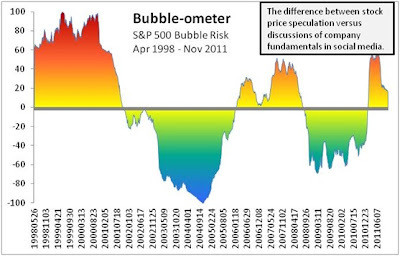 The Bubble-ometer is simple in concept but has been predictive since it was developed as seen in these past Bubble-ometer posts: calling the late 2010 rally and identifying a Bubble top in June 2011. We're working on a more complex version of the metric as can be seen in the second blog link above, which we're calling the "market risk index." We're also comparing sectors to identify arbitrage opportunties. Please sign up for our free monthly newsletter, and we'll keep you posted about these developments. Thanks to a recent mention on the Wall Street Journal site by Jason Zwieg here (thanks much, by the way) we had a record number of people taking the test. So many infact, that it temporarily crashed our servers. We apologize to anyone who did not get their test results. The test should be up and running now. Thanks to all those who took an interest and completed the assessment. We hope you'll find your results interesting and useful. And please don't hesitate to reach out with any questions you may have. 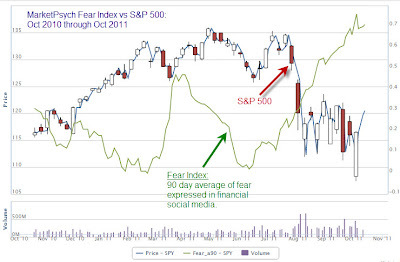 The MarketPsych Fear Index has remained high despite the recent rally in the S&P 500. This is actually a very bullish sign for the next couple of months. Investors "anterior insulas" are still "hot" from the unexpected and relatively traumatic selloffs of August, and as a result, most of those with a hair-trigger panic-sell reflex already exercised their right to sell at the bottom. While uncertainty and volatility is virtually guaranteed for the next 12 months (pending election, further defaults in Europe, Iranian belligerence, etc...), we're likely to see an equity rally through year-end. 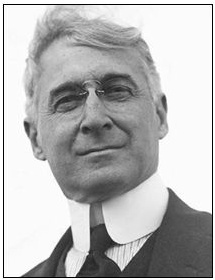 Bernard Baruch opposed the reparations terms of the Treaty of Versailles, knowing them to be impossible for Germany to fulfill following the destruction of WWI. I wonder how Baruch would handicap recent events, as German taxpayers summon the will to bail out the near-defaulting states of Europe's periphery (or rather let those countries default and then bail out their own banks directly). We're in psychological terrain - confusion, declining confidence, political gridlock - that sets us up for a real economic danger not only in Europe, but also in the U.S. - a developed-world debt spiral. A debt spiral is a self-fulfilling prophecy of decreasing confidence leading to risk aversion, economic stagnation, and an ultimate debt default and/or collapse in the banking system. In the psychological literature there are a few insights to inform us about what may come next and what we can do to prepare. Please CLICK HERE to join us for our Free Webinar on "The Psychology of a Debt Spiral (and Positioning for the Next Stage)" on Monday, September 19 at 4:15pm EDT. 1. What are the stages of a debt spiral? 2. What is likely to happen to European sovereign (PIIGS) debt? 3. Why financial stress goes on until "capitulation" occurs - even after fundamental uncertainties have been resolved. 4. Solving a debt spiral: The role of leadership, and how politicians can use psychological insights to improve confidence and the economy. 5. The best investment positioning in this climate. We're facing more than a routine correction in the markets. Despite excellent corporate earnings and 60-year lows in interest rates, equities have sold off sharply and are poised to decline further. The reasons for this trap are fundamental to a tipping point, and past that point psychological drivers - such as loss of confidence - take over. This loss of confidence is reflected in the angry public mood in the U.S. and Europe. When angry, people blame – some blame high frequency traders, while others blame the Fed, politicians, or even successful minorities or professionals (e.g., "bankers"). As investor anger grows, risk-taking and spending decreases. In fact, simply being exposed to another’s anger reduces spending and financial risk-taking (Winkielman et al., 2005, Trujillo et al., 2006). As a result, anger depresses a consumer economy and that country’s financial markets. One result of anger is mistrust. And if investors no longer trust the goverment to turn around the economy, then who can they trust? This is the nagging doubt that ultimately collapses confidence and fuels a debt death spiral such as the one we are at the cusp of. In a debt spiral, increasing investor fear leads to decreased spending and investment, and thus a contraction in economic activity. Due to the economic contraction, government receives less revenue and is inclined to cut back spending further. Ultimately debts cannot be paid, credit collapses, and an economic depression ensues. When confidence collapses politicians are forced to reveal, and voters are forced to confront, the truth about our current economic malaise. The truth contains unpleasant information: demographic time-bomb, underfunded pensions, public and private over-indebtedness, entitlement costs rising faster than economic growth, to name a few. Naturally government officials (especially elected ones) are reluctant to speak honestly about the magnitude of the liabilities being faced nor to call for sacrifices. This reluctance to speak openly is defended as not wanting to stoke more fear that could accelerate the debt spiral. What we hear from politicians is characteristically benign – but does not address policies or procedures to deal with a debt default (which further weighs on confidence). Consider the estimated more than $100 trillion in future U.S. liabilities in the context of the current U.S. debt of over 80% of GDP. Most developed countries cannot pay back the money they owe without major structural changes (immigration, high inflation, currency devaluation), and eventually many will either stagnate or default. This has already happened in Greece, and may happen sooner rather than later in other European states. The default contagion is likely to spread to the U.K. and the U.S. within a couple years. Austerity will accelerate the “day of reckoning” since we already appear beyond the tipping point. This is what accounts for the market’s declines following the debt ceiling agreement. Fiscal stimulus is a "Hail Mary" - it will delay the day of reckoning and will stealth-tax everyone (except gold and some property owners) through inflation. However, if the stimulus is spent on truly productivity-enhancing projects (broadband internet access, high-speed rail, electric car infrastructure, an energy-independence “Manhattan Project,” breakthrough applied basic science research), then it has a long-shot of succeeding. To restore investor confidence, trust in leadership must be restored. Honesty and forthrightness from leadership about our debts, with credible plans to address them, are necessary. There are lessons from the psychology of addiction that will indicate when the current crisis has finally run its course. The process of the economy and the markets hitting bottom is parallel to the idea of an addict hitting bottom. You can recognize “hitting bottom” when you see acceptance of the dire situation from political leaders, hear honest talk about mistakes made, see proposals of fundamental structural and policy changes to address those mistakes, and hear the “we’re all in it together” ethos expressed with sacrifices expected from all economic classes. In essence, when you see leadership with credible plans. A long-term question is, will politicians be able to stand together when economic confidence collapses, or will opportunistic blaming continue? If European voters express support for closer political union – federalism – in Europe, then the fundamental Euro crisis may gradually be resolved. But that is unlikely based on the results of the recent election in the German state of Mecklenburg-Vorpommern. More likely Europe and the Euro will stumble along with more and bigger band-aids. As anger and frustration rises, political positions polarize and the choices become, by necessity, more extreme and unity less likely. Democratic voters are easily swayed by mis-information that resonates with their emotional states. So without steps made towards federalism in Europe, the Eurozone will continue to suffer, and some members may leave (if that were possible). If the crisis leads to a real collapse before the U.S. election of 2012, then look for coherent and forceful leadership before stepping into the equity markets. Although a big panic that creates values before then is also a good short term opportunity. Note the image to the left showing the collapse stage of the Nasdaq bubble - there were a series of short-term panics before the actual bottom was put in. In particular, look for honesty about past mistakes, significant policy changes to prevent those from happening in the future, and the sharing of fiscal pain across classes. Also positive would be a stimulus that actually focused on productive investments, not just pork or taxpayer "relief". The debt spiral and collapse of confidence are unfolding now, and equity and bond markets are likely to be suffering until mid-October. Consider gold and cash as safe havens (gold can still run dramatically before it peaks). There is no reason to “buy the dip” at these levels. There may be more dipping to come. 1. We called the market rally from September 2010 through April 2011. 2. We identified an equity bubble publicly in June 2011 and cited the risk to investors. 3. Dr. Murtha was on NBR on August 2nd explaining that a major correction is due (the day before the first crack in the markets). 4. We called a bounce "Turnaround Tuesday" off the Downgrade lows, to be followed by continued selling. 5. We even threw in a few one week buys during the savagery. BAC turned out very well, but HPQ lagged the market a bit. We look forward to discussing these issues further at the webinar! HPQ heads-up: Our media analysis is showing a recent uptick in bullish forecasts on HPQ stock (following on a series of very negative comments after several unpleasant surprises and a 20% stock drop following recent earnings conference call). Such patterns generally lead to stock outperformance over the subsequent week. See HPQ sentiment graphs here at marketpsychdata for more information. After the roller coaster rides of the last couple of weeks in the markets, many of us in the financial advisory business walk in to the office with knots beginning to form in our stomachs - and out at the end of the day looking for the closest martini bar. Our routine consulting methods seem ill equipped to address (not to mention resolve) the angst we encounter in the faces and voices of our clients. For our advisor readers, the MarketPsych Insights team assembled the following list of steps we think are a handy reminder of time tested methods that are usually helpful. 1. Start with EMPATHY by exercising true listening skills and gently probing for emotional (and perhaps thoughtful) reactions to market gyrations, we serve a valuable role as sounding boards to relieve client tension. The most important aspect of this step is to shut up and let the client talk. Think of yourself as a steam valve. Every time you ask a question, or state an opinion, you are preventing high pressure steam from being released. Let the client unload; you may get new and valuable insights into their fears. 2. Be prepared to help them EVALUATE PERSONAL IMPACT of any changes in their wealth levels. Not only is this helpful in moving the discussion into more deliberative (i.e., less emotional) territory, but it also helps to extend the investment time horizon beyond short term whacks into longer term plans. In all of my recent client meetings, we review their financial security analyses to clarify what (if any) implications result from short term losses in value. People are usually better off than they feel. 3. Remind them that huge market volatility always brings OPPORTUNITIES. The key idea is to provide an inventory of solutions (investment or otherwise) that will add value over their investment horizon; if they are prudent enough to make decisive action now. Making decisions in tough times also provides clients with a sense that they have at least some control over their destiny, which is always a good thing. 4. Discuss process and methods to institute DOWNSIDE PROTECTION. You might institute something a simple as an agreed set of automatic triggers for communication or portfolio actions. These may include only communications, or perhaps move to more complex venues such as put options, or other portfolio protection measures. You may also explore identifying shifts in asset mix to more undervalued yield oriented strategies as well as the consequences of doing so for longer term planning. Again these measures provide the client with a broader set of tools to manage their emotional fears and feel a greater degree of control. It is in times like these that we either strengthen our relationships with clients, or find them eroding. Spending more time in dialogue with clients in tough times is not only good for them, but it is good for you (and your business). MarketPsych gets a quick mentino over at the Smartmoney blog, courtesy of Kelli Grant. Would you rather have flowers in your garden or a bunch of gnarly weeds? Not so when it comes to investing. And at "crisis points" like this one (markets down another today and fear is getting higher than Timothy Leary at a Grateful Dead concert ), it puts investors at risk for one of the biggest investing mistakes. When the market is as scary as it is right now, there's always a temptation to sell. Perhaps to avoid further losses, or maybe just to have more cash available to go bottom fishing when the dust settles. Awkward phraseology notwithstanding, at times like this many investors will look to liquidate some stocks to free up cash. The temptation will be to sell the stocks in which you have the biggest gains. Here's the problem. The stocks that have performed well have done so, because they are BETTER stocks. There may be exceptions, but stocks that go up are by DEFINITION better stocks than those that don't. Here's MarketPsych's internationlly famous "Wicked Gardener" Analogy. Your portfolio is a garden. Good stocks are blooming flowers. Bad stocks are weeds. 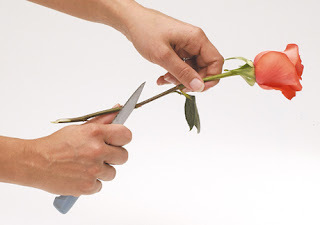 Many investors free up cash at times like this by clipping those beautiful flowers and holding - or in some cases watering (i.e. buying more of) -- those weeds. By doing so investors systematically clear out their quality holdings, ensuring that what remains in the portfolio are lower quality, worse run, worse performing companies. Be aware of not only of this temptation, but also the underlying motivation. When looking at positions to sell, ask yourself this; are you chosing the stock because it is the one you should going forward? Or are you really selling a stock because it hurts less than realizing a loss on a position? And be 100% honest. Because if it's the former - good for you. If it's the latter, well, we can relate, but protecting your feelings comes at the cost of protecting your money. It's a recipe for long term investing failure. You do what's right with your money. I'll work on my metaphors. I commented on this on last night's Nightly Business Report, but the debt crisis has revealed a fascinating an unforseen shortcoming of the Market. But first some perspective. Do you think for a moment that if we decided to raise the debt ceiling quietly and without any fuss that the markets would have blinked? I mean, it's been raised 74 times since 1962. Ten times since 2001! What? Is the 75th time the charm? And it's not like our national debt snuck up on us. A few miles away from me at Union Square there's a gigantic COUNTER revealing the national debt up in real time. So what's the big fuss? Why did people, who could have shouted "DOWNGRADE!" in a crowded market any time over the last few years, pick this moment? Here's the dirty little secret: The Market can't focus on EVERYTHING. It just can't. The Market (i.e., the investing public) doesn't have the mental bandwith to factor in every variable. So it can only focus on a few issues at a time, usually the ones that appear most urgent or emotionally charged. Avoidance works. And a problem isn't a problem until we decide it is. That's what makes a bubble. A whole bunch of people decide to ignore a problem... until they don't. So instead of getting a relief rally for defusing the debt-ceiling time bomb with 1 second left on the clock, we got a renewed attention on some significant problems. The rose-colored glasses are off... the shades are on. And they have given people a dimmer view of our plight. It's actually quite ironic if you think about it. If we had chosen to raise the limit and ignore the problem - just as we've been ignoring it for years - August 2nd would have come and gone without incident. When we decide to, you know actually address the problem for once... we are "at risk for a downgrade". MarketPsych's Co-founder and resident genius, Dr. Rich Peterson, has a fascinating post below on what the implications may be. We invite you to check it out. In the mean time, happy investing. 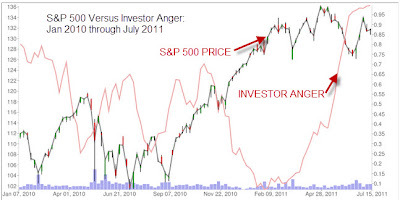 When I compiled our financial sentiment indices in the mid-2000s, I never imagined I'd spend so much time looking at the "Anger" and "Trust" metrics. Ah, how the world has changed. FYI, hear an interview of Jason Zweig (WSJ), Tess Vigelund, and myself here on MarketPlace Money (NPR). Despite so much anger, we've only just begun to see fear creep into the stock market. There has been an enormous divergence between investor sentiment (which has become exceptionally negative) and market prices (which have stayed relatively flat). Part of the reason for flat prices is that more than 80% of the companies reporting 2Q earnings this season have beaten their analyst consensus estimates. That's incredibly bullish. Furthermore, there is a party going on in Silicon Valley. Start-up tech companies are being routinely valued over $10 million, even without a working product. It feels good to be in coastal California right now. So now let's talk about what is likely to happen. How this might play out assuming each side is negotiating from a sincere position (in game theory it is sometimes advantageous to "act crazy" in order to increase one's negotiating clout, as the Tea Partiers may be doing). (long term, psychologically speaking, this situation is all bad, but more on that in a later post). 2. The negative outcome is unprecedented. 3. There is little that can be done to prepare for a negative outcome. Unfortunately the negative outcome is also the most likely, and the debt ceiling will not be raised by August 2nd. If this negative event occurs, there are likely to be band-aids applied - an executive order raising the debt ceiling, social security check IOUs redeemable at most banks (as California issued each of the past three years), and interest payments to bond holders that will be paid. Yet there is a sense of foreboding and doom about the negative outcome, precisely because we don't know what it will look like. (In fact, if you're a contractor for the State of California, you know exactly what it looks like - IOU certificates and long delays in payments). Since we know some potential outcomes, let's discuss those to dissipate the doom. What if there us a ratings downgrade of U.S. Treasuries to AA? - Based on the regulations for pension funds, banks, etc... to hold AAA Tier 1 assets in part of their portfolio, there simply won't be enough liquid assets for all that money to move into. - This would necessitate a change in the rules governing "secure" assets. So fundamentally, very little would happen except a lot of confusion and panic in obscure derivatives markets that we haven't yet heard about. In terms of the negotiations themselves, the psychology has played out such that neither side can back down. If either backs down, they will lose face with their constituents. If they both go through with the default, then they can both claim victory (of sorts). Recall that Tea Partiers were elected to throw perfectly drinkable tea into the ocean - to cause short term pain (refuse a debt ceiling increase) for longer term gain (better fiscal management). And we're currently seeing Obama's (necessary) second "stand" - healthcare reform was first. See that graph of Anger above? Anger causes people to become LESS flexible, not more. As a result of this angry (and very public) game of chicken, neither side can back down. So ... missing the August 2nd deadline is quite possible. "Default" on interest payments is unlikely, but issuance of "IOUs," an executive order based on the 14th amendment, or some other interesting stopgap measure is likely. So expect a downgrade eventually. Expect a market sell-off. Then expect a rebound in the short term after the panic. (The panic in August will be good time to buy for the short term). Long term we're seeing the symptom of a systemic disease - a disease of the U.S. political system that will not be cured without some type of major surgery. Let's hope we can find a good surgeon. Happy (or at least not Angry) Investing! Labels: debt ceiling raise, debt default psychology, investor behavior, investor sentiment, market psychology, political inaction, what will happen if the U.S. defaults? "There are a lot of worries out there, but people aren't very worried." No, Yogi Berra, has not been brought on board as a guest blogger. 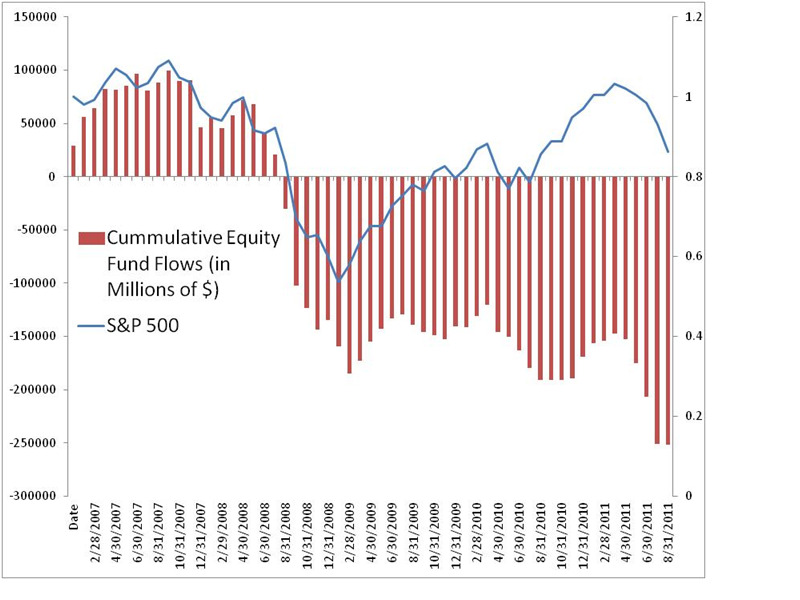 This is just the best way to explain the strange paradox of the U.S. Equities markets in July of 2011. Portugal, Italy... to be continued). 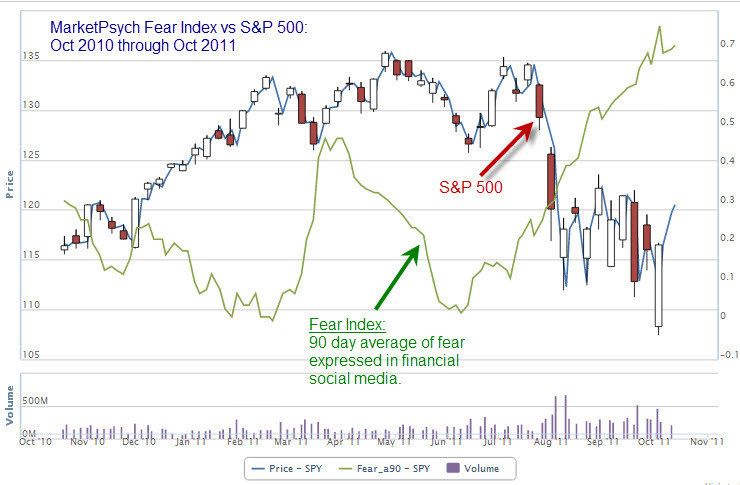 Yet, MarketPsych's sentiment indicators show that worry/fear were actually much higher earlier in the year. 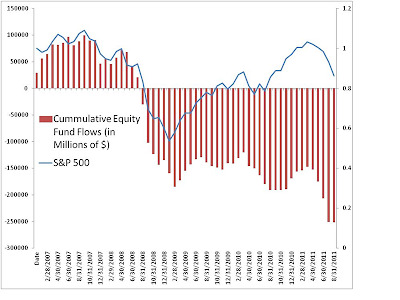 That's not to say that investors aren't emotional. going strong. This divergence is noteworthy... and strange (see below). 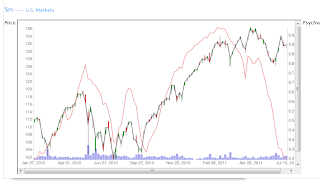 The red line represents Investor Sentiment since the start of 2010. The gray/green/red line represents the peformance of the S&P 500 Index. Maybe this unusual split is because fear does not appear (for a change) to be the dominant emotion. 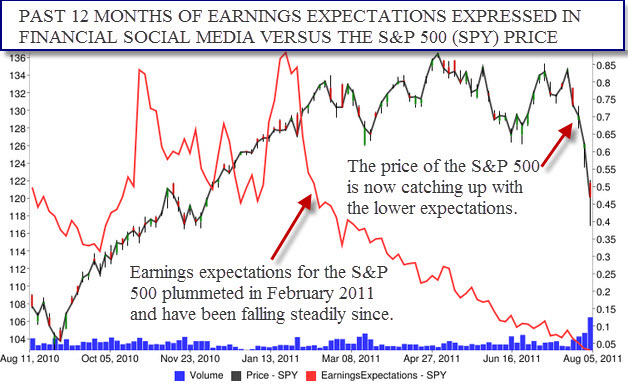 So if fear isn't driving sentiment... what is? 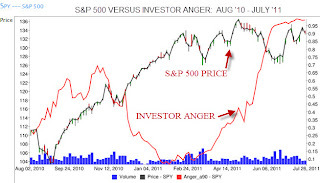 ANGER: People are ticked off at the forces behind the market, and likely still bitter about the effects of the banking crisis in '08. TARP and the political wrangling over the debt ceiling in the U.S. cetainly isn't helping assuage this feeling. DISGUST: Disgust is often felt in reaction to things that are unclean. That's a good way of describing investors emotion. Investing just seems to be a dirtier business than it used to be. And they are revolted by it. LACK OF TRUST: People are more cynical about the equities markets, and less likely to believe the authority figures are willing or even capable to do what they pledge. 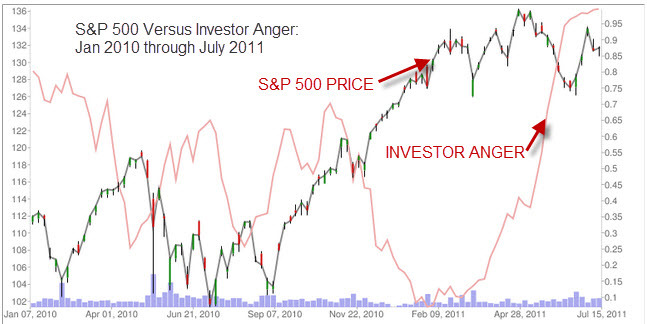 So investors are "Mad as hell"... but will they "take it anymore"? So far, the answer is, "yes". But doing so appears to have created a great deal of emotional tension. Two ideas in my recent experience have given me a new appreciation for longer term thinking (and in particular, my personal responsibility for the actions of others who will be impacted). 1. It takes about 100 litres of liquid over the aging process, evaporation, and years to ultimately produce about a litre of final product. 2. Fruit starts in a larger barrel and as it ages, is moved into smaller barrels. The picture nearby indicates the evolution of balsamic through five barrels in a row that reflect a particular vintage year. 3. The fruits planted in one generation are actually cultivated in the next and harvested in generations beyond. Obviously, in planning a business that, by its nature, is multigenerational in scope, the family is forced to think about who will succeed them to make decisions. As well, the current owners realize that they own the responsibility of shaping the character of their family and ultimately ensuring appropriate training for the job. The second idea instance emerged through an excerpt from the book, Moral Intelligence 2.0 by Doug Lennick and Fred Kiel. It contained a reference to a State of the World Forum in which a presentation was made by a Polynesian tribal chief from Hawaii. In describing how his people thought about responsibility and accountability, the chief indicated that, in his culture, it was presumed that current leaders were accountable to the three generations that preceded them and responsible for the seven generations that followed them. Let that sink in for a moment. Not only were people expected to be responsible for their own actions, but in fact, had some obligation to include the rules and teachings of three prior generations in their current decision making, and the personal responsibility for identifying and teaching their successors in a way that influenced the next seven generations. I suspect that most of us would have difficulty (and perhaps some sleepless nights) believing we were responsible for 11 generations. However, I do also believe that there is unusual value in considering how our personal actions and decisions reflect the views and moral teachings of those who preceded us. Additionally, even modest amounts of effort to enhance the capabilities of those who will succeed us will undoubtedly have a major impact on our communities both near and far. As we think of recent couple of years of market whacks that reflect short term thinking, and perhaps myopic greed, I suggest we ask ourselves (and those close to us) questions arising from a longer term perspective. Most importantly, we should remind ourselves that we are more responsible for others than we might think. Is the Market Bubble Bursting? (see chart). 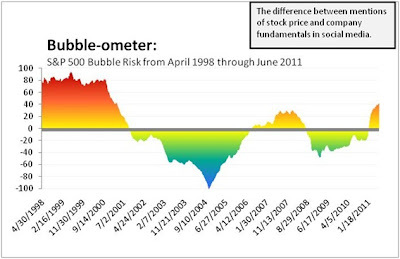 For a talk earlier this week I reproduced our "Bubble-ometer" first profiled in Fall 2010 for the period from April 1998 through June 22, 2011. It turns out that based on this simple metric of the number of mentions in financial social media of stock price action versus the number of mentions of company fundamentals (speculation versus thoughtful investing), we're likely in the midst of a speculative bubble. 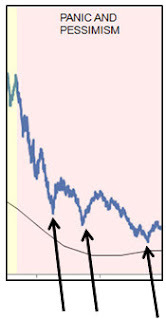 Gold Miners (GDX) in April 2011. Outlook (future-oriented) is positive and rising. Expressed Fear and discussed Dangers are low and declining. Expressed Joy and Positive Superlatives (“Best!”) are high. 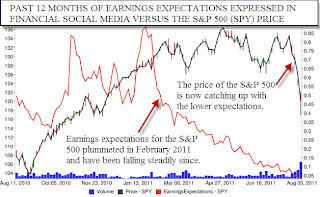 High frequency of discussions of positive earnings surprises. Discussions about the stock price are significantly more common than discussions about accounting fundamentals (a sign of “day-trading”). WHAT TRIGGERS THE IMPLOSION OF A BUBBLE? SIGNIFICANTLY: Outlook (beliefs about the future) diverge from actual events (reality) at a peak. In most cases, prices start to fall, but Outlook remains positive until surprising negative news collapses the Outlook vs. Reality disconnect. Joy gives way to worry and doubt. ARE WE AT THE PEAK OF A COLLAPSING SPECULATIVE BUBBLE? Most importantly, did we see a market peak this April? Suprisingly to me, the data suggest yes. I'll keep working on the research, but the preliminary results indicate the next year is unlikely to be good for long-only investors. Sign up here to keep abreast of our research via our free newsletter. 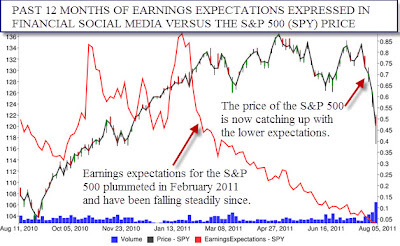 Lunch event tomorrow: I'm explaining how SOCIAL MEDIA PREDICTS THE STOCK MARKET tomorrow (Tuesday June 21st) in Los Angeles at CFA Society (open to all): http://goo.gl/GnGQH. I was just at the Battle of the Quants in London last week, moderating a panel on the use of social media data in predicting stock prices. A number of funds are doing this, including our own fund (MarketPsy Long-Short Fund LP) which did it successfully for 2 1/4 years. We've blogged about it before. It's a bonafide MarketPsych pet peeve, the financial equivalent of watching someone chew with his mouth open or say, "irregardless". What will it take to keep people from being "surprised" at "unexpected" results from noise-laden, short-term indicators (I'm looking at you, Jobs Report) comprised of 33% data, 33% speculation and 33% magic pixie dust? This article by Randall Forsyth at Barron's says it quite well. Of course, we have been making this point for a long time, here for example. Now if you'll excuse me, I have to stop blogging now so that I can find a brick wall and bash my head against it repeatedly. The Euro-zone Will Split - "It's the incentives, stupid!" During the financial crisis I found it helpful to ask myself, "what is the worst that could happen?" and "what EXACTLY does that look like?" By going through the steps of "the worst" it became apparent that the U.S. government could pump money into the system ad infinitum. Despite the risk of inflation, this was the preferred course of action through stimulus packages and bail-outs. Politicians knew that if the economy collapsed, in addition to widespread misery and unemployment, they too would lose their jobs come the next election. As a result, the political imperative was to inflate. We're seeing a different problem in Europe. Spending cuts have caused economic malaise and the huge structural inefficiencies in the PIIGS (sorry) will not be addressed in less than 10 years - educational and institutional weakness take a while to progress past. Fiscal austerity is leading to economic deflation in vulnerable countries and social unrest. Most people in Greece and the other PIIGS want employment and dignity. They will soon be finished with the humiliation of budget cuts, indebtedness to German banks, and 20% unemployment. Recall that unemployment and losing a sense of dignity inspire anger (and are even the fuel of suicide bombers). These are powerful forces. The incentive for the populations of these countries is to default, exit the Euro, and start over with a "Junior Euro." Democratic citizens will demand a default. If the current politicians won't do it, eventually they will elect ones who will. As the political cycle moves forward, and one country successfully defaults (oh, wait, Iceland already did!) all the PIIGS will default (or "restructure" their debts). No economist can defeat human nature. And the consequences? Well, if you've read the excellent book "This Time Is Different," you'll see tables of data indicating that most countries that default a few years thereafter have better lending conditions. Personally I'm surprised that this trade opportunity - to short PIIGS European debt and even better, Spanish banks - has remained open for so long. Maybe another example of delayed learning (it takes us a while to learn and adapt to a new reality like the possibility of "developed" countries defaulting). And implications of this default for the U.S.? Near term money will move to U.S. dollars as the safet trade. Long term? Less inflation of commodities than you might think - China is going to have its own bubble pop (benignly, hopefully). Definitely gold will do well. Yes, gold is in a "bubble", but with real structural momentum behind it, it is likely to go on for a while. Each additional blog will introduce a market bias, myth or mind trap and demonstrate how to create a new behavioral skill that will give you a new positive response to market conditions. It is always easier and faster to make improvements by working with someone who can provide an outside frame of reference andsupport for change. We at MarketPsych are ready to provide coaching and training for you and your organization. "The mind has a job. And that's to give us all the stories that prove that what it thinks is true." The world comes at us with a seemingly infinite amount of data every day. What we see, hear, touch, taste and smell is more than we can possible take in and analyze in real time. So our brains perform some wonderful services for us. The amygdala, located in the limbic part of our brain scans our world for threats. 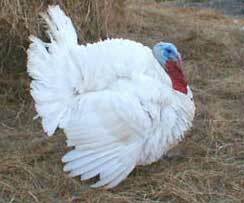 It has no self-conscious awareness to slow it down, so it is very very fast (think startle reflex). 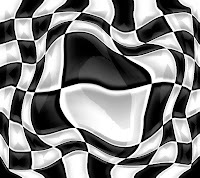 It has libraries of threatening patterns and when it senses a pattern match in our environment, it reacts very quickly. I was jogging in the woods some time ago and found myself leaping sideways to the other side of the fire road. I was on a collision course with a rattlesnake. Without conscious thought, my body reacted quickly. The brain also takes complex tasks and automates them so we don't have to consciously direct every detail. By combining patterns of neural activity into larger complexes neural structures, we can drive a car and while having a conversation with a passenger. The brain also filters out huge amounts of information that isn't judged to relevant. Additionally, it identifies, defines and codes raw data into a simple concepts. 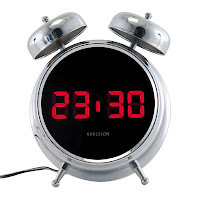 When the wake-up alarm goes off in the morning, our brain doesn't have to create all the logic to identify the raw decibels, pitch and tone as an alarm…it already has a "table" that simply says "alarm." If we didn't have these functions, the amount of data coming to us would be overwhelming. We couldn't even get out of bed. But all this pre-processing also shapes the information that we receive in our conscious brain giving us a distorted sense of reality. And one of the most powerful distortions our brain creates is "stories." In addition to the pre-conscious information organizing process where our brain filters, deletes, automates and structures our information, the way we remember it and give it meaning is by creating stories around related parts of data. During the height of the Japanese nuclear reactor scare recently, I was at a training that included a number of new age therapists. They were eating seaweed to help protect them from potential radiation. I called my daughter who works as a project manager at NASA and asked her about the risk. She sent me the assessments which stated that the risk is insignificant. 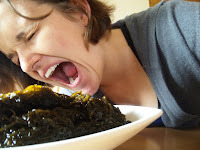 I relayed that to the "seaweed munchers" and the response from one person between mouthfuls was, "Oh, the government just doesn't want us to know." It is easy to chuckle and see this as a story fabricated by someone who needed to believe that they needed to protect themselves against an unseen, unfelt danger. However, it is much harder to see these fabricated stories in ourselves because they don't feel like stories, but they feel like reality. As Byron Katie stated in the opening quote, stories are created after the fact, after our beliefs are in place to give us comfort that they are true. As professional money managers, traders and investors, a costly bias is taking our own stories at face value. But if our stories are necessary, and we can't help but create them to give us meaning and memories, how can we deal with them as investors and traders? The answer is to see our stories as simply stories that we create. This awareness, without judgment or criticism allows us to reframe them and use them positively. Once we see our stories as self-created, then we can observe them and learn from them. One of our jobs is to continually "Shred our Stories." This of course is a lot easier said than done because the closer our "stories" are part of our our survival mechanisms and beliefs, the more we become attached to them. However, when we frame our stories as models that simply help us navigate the current world, the easier it is to "shred" them when they no longer become useful. You can create the "Story Shredder" Mind Muscle which will help you shred stories that are no longer useful. The more you use it, the stronger it gets. The first step is NOT to create useless stories in the first place. One way to do this is to watch or read the news as if it were a series of "fairy tales." Look at these fairy tales as a bucket of emotional content created to support what we want to believe. Pay attention to the emotional content and how it will shape the stories of others and their investing behaviors. Look at all other information sources in your life that feed the creation of stories and reframe them in a way that allows you to beaware of them without allowing them to feed your beliefs. The second step is to practice "shredding." 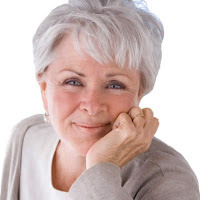 This original format was created by Byron Katie (TheWork.org) and I have adapted it for you. First, find a story that you depend on and believe to be true. To make this first one easy, find a story that isn't that critical to your life. Now ask yourself the following questions. Next, find a story that contradicts the story you are shredding. Tell yourself THAT story. Embellish it. Create all the details you can. Notice resistance to the new story. But do it anyway! Let yourself fully experience the new stories. Find three examples in your life where the new story is true. This is not about making you wrong, just about discovering alternatives that give you "story freedom." The Mind Muscle homework is to "Shred a Story a Day" using the four questions. You can start with non-critical stories and work your way up to the ones that are connected to your survival. As you do this, you will start to notice the "stories" others tell themselves and recognize them as stories. 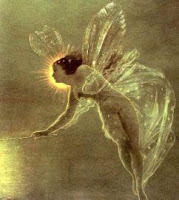 You will see the news, not as fact, but as interesting fairy tales that have an impact on the world. You will look at the market and notice the stories you bring to the interpretation. Mind Muscles(tm) are like physical muscles, the more you use them, the stronger they get. However, just like muscles, you may notice some "fatigue and soreness" when you first start to exercise them, but keep it up! Soon you will be shredding stories as easily as a piece of paper. As you build this Mind Muscle(tm) you will see more information with less bias and see new market patterns emerging early and faster. MarketPsych took some time out of its busy consulting/speaking/writing schedule to share another Digital Short Film. 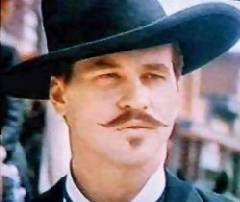 This one (once again starring Jim and Fast Eddie) explores the concept that behavioral finance people call, "Herding". A concept which, if you think about it, is really another way of saying "Peer Pressure." Yes, Peer Pressure. That same powerful social force that perhaps in your younger days caused you to do things like get a "mullet" haircut, procure special oversized "warmers" for your legs (when, in fact, they were in no need of warming), and pretend you actually enjoyed your first cigarette. Well, we're all older now. Wiser too. But peer pressure still lies at the heart of many investing failures. The key to overcoming this force (in high school or the stock market) is to develop a strong enough identity (i.e., sense of who you are) to make decisions based on what's right for you - not what you see others doing. We invite you to click on the film clip above or if you prefer, here, to follow the adventures of Jim and Fast Eddie, and maybe have a laugh while you do so. Please visit us at http://www.marketpsych.com/ for more information on the books, products and services we provide to the financial community. Happy investing. And hey... let's be careful out there.